I would be remiss if I didn’t post some photos of the snacks bars I baked from the Dark Chocolate and Walnut Banana Bread leftover batter. These cook up very quickly and can be enjoyed after a very quick cooling. Sometimes, my husband wants me to just bake the bars because he’s not very good at waiting for the loaf of bread to cool. Just make sure to line the pan with parchment paper. It makes life easier when you remove the bread from the pan – especially since it’s thin. You can forgo the loaf all together and just make a larger batch of the snack bars. 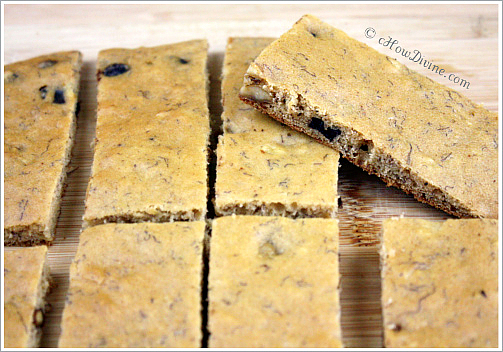 And of course, you can make it thicker than the snack bars pictured in this post; just bake them a little bit longer. 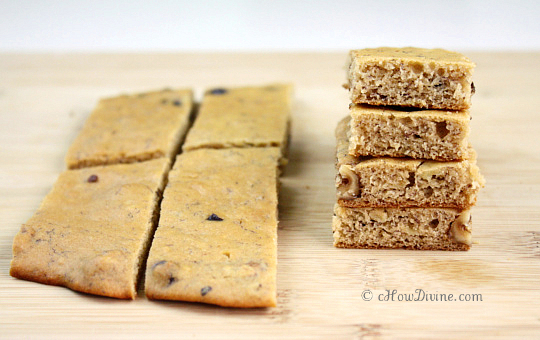 For convenience sake, I re-posted the recipe below with directions to bake the bars in bold. *Note: I used a brown rice (1 1/4 cup), sweet rice (1/2 cup), and tapioca (1/4 cup) flour blend of my own. Sweet rice flour and tapioca flour are useful in gluten-free baking, because they are good binders. Preheat oven to 350 degrees. Prepare a brownie pan or cookie sheet with parchment paper. In a large bowl, sift or whisk together the dry ingredients, EXCEPT for the sugar: flour, baking powder, baking soda, cinnamon, and salt. In another large bowl, add ripe bananas and mash well with a fork. Add sugar to the mashed bananas and mash the sugar into the bananas. Make sure that the bananas are as well blended into a puree, and there are no visible large lumps. The grittiness of the sugar should help the process along. Add rest of the wet ingredients: agave nectar, eggs, canola oil, applesauce, and vanilla extract. Mix well. Stir in the dry ingredients from step 1 in 2 batches. Once the dry ingredients are incorporated, add the toasted nuts and dark chocolate chunks. Mix gently. Pour the batter into a loaf pan. Fill only up to 1/2 of the pan. Bake for 45 minutes to 1 hour, until a toothpick comes out clean. Cool for about 15 minutes in the pan. After 15 minutes, cool on a cooling rack. When cooled, but still slightly warm, wrap tightly in saran wrap. It’s best if eaten a day after. With any left over batter, thinly spread the batter on a prepared cookie sheet or brownie pan. Bake for about 20 minutes. Cool on the pan for about 10 minutes. Carefully lift out the contents and cool completely on a cooling rack. Cut into about 1″ x 3″ pieces. Enjoy. I love dark chocolate! I’m definitely putting this on my list to make. Thanks. You are welcome Suzy! Who doesn’t love dark chocolate, right? Thanks for the recipes , my family is recently GF and it is a great help! You’re welcome Melissa! I hope you and your family enjoy them!